This is the third of a series of spotlights on our summer 2016 student volunteers. Learning Life’s student volunteers this summer are translating documents, conducting research and doing outreach locally and internationally for our new Citizen Diplomacy Initiative (CDI) established this year. CDI will connect American families in Washington D.C. with families in other parts of the world through live online video-dialogue starting this summer. 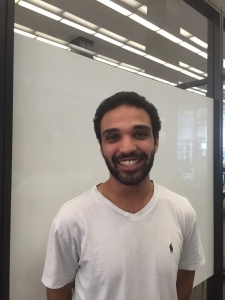 Omar has been providing invaluable help in translating CDI documents into Arabic, developing a database of metro D.C. language teachers, and assisting with outreach in Jordan. I was born and raised in Jeddah, the second largest city in Saudi Arabia, and the largest seaport on the Red Sea. I am a senior at George Mason University majoring in Communication and Public Relations. Reading and writing are my pastimes when I’m feeling productive. I like to read about different theories, from Kantian Ethics to securitization views in military. But mostly I read opinion pieces and blogs on social and political issues. I try to learn the way writers present and express their thoughts, so I can improve my own writing. Most of what I write regards social issues, although I don’t publish, I just keep it to myself. On my days off, I like to wake up and leave the news on for an hour or two while I get ready for my day. My idea of a good night is hanging out with a group of friends and maybe playing a very popular card game we have back home in Saudi Arabia. Eighty feet under the surface of the Red Sea, there is a spot called Cable Reck, where a ship carrying construction materials sunk in 1978. The Red Sea has a lot of marine life and good visibility down to 160 feet, so seeing the ship and the sea life in natural light was beautifully tranquil and intense. is covered with cables at the bottom. The tranquility came from the calm sounds of deep water diving, the intensity from having some of the most dangerous sea life swimming by, like a 4.5 foot barracuda, eels and sharks. I would say that my time in the United States has been one of the most effective experiences I have had. Unlike my home country where most people share a common way of thought, in the United States the diversity of opinions is eye opening. Although Saudis have a wide range of views on the religious spectrum, for instance, they are all regarding the same Muslim religion. In the United States, however, there are not only different liberal and conservative views, but also a mix of religious and non-religious views. Working with Learning Life is not only a chance to help myself, but to help others. I really believe in the power of both education and awareness programs. In some way Learning Life is a bit of both: it spreads learning in new ways, but it’s also an awareness campaign for the importance of education. I plan to work in the corporate side of the public relations field. I hope to make the need for corporate social responsibility a wide spread view in Saudi Arabia. The idea that the community is one of the stakeholders of a company is still relativity new. I believe a lot of good can come about if companies are socially responsible. I want companies to realize that public support is the reason they make money, and that they should give back, not just take. « What’s Your Position in the World? » What are the ingredients of career success?